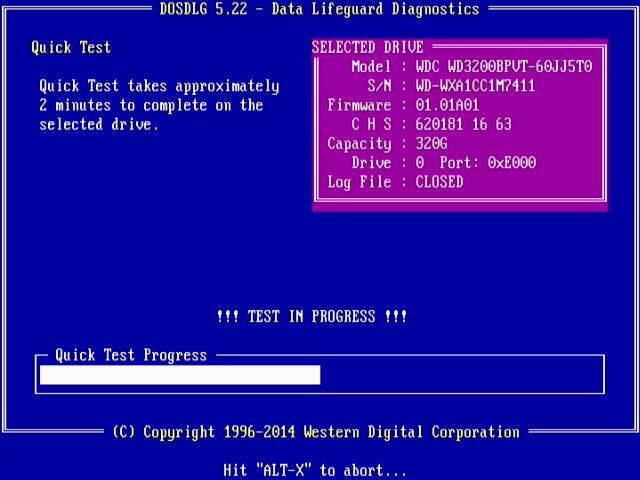 Data LifeGuard Diagnostics is designed to test the physical condition of your hard drive. This utility is designed for drivers larger than 8.4 GB with model numbers starting with WDxxx. This program is designed to work only in a DOS booted environment. Create a DOS bootable USB following these instructions. Boot from the USB. Make sure that your boot order in your Bios is set to boot from the USB drive first. At DOS prompt type dlgdiag5.exe to run the program. SELECT DRIVE - Always choose this option first, as it determines which drive you will be working on. QUICK TEST - This option tests your drive quickly for any major physical problems. (Please note: Although this option is safe and does not alter the data on your hard drive, Western Digital recommends that you have a current backup of your data). EXTENDED TEST - This option checks your drive thoroughly and it can repair any correctable errors. (Please note: Although this option is safe and does not alter the data on your hard drive, some data loss may occur, depending on the errors found and the errors corrected. Western Digital recommends that you have a current backup of your data). WRITE ZEROS TO DRIVE - The Write Zeros option, wipes all data off your drive. This option used when your data is no longer usable or recoverable. If you no longer need any data from your drive and would like to start over, run this option to set your drive to an as new condition. NOTE: Please make sure that you have selected the correct drive to perform this function on as once ran, no data will be recoverable. ENTER AND PRINT RMA INFORMATION - Information pertaining to each drive tested can be customized and printed with this option. HELP - Brief descriptions of each option in addition to explanations of error codes are available in this option. Select the task you wish to perform.